Basal cell carcinoma is a type of skin cancer that most often develops on areas of skin exposed to the sun. 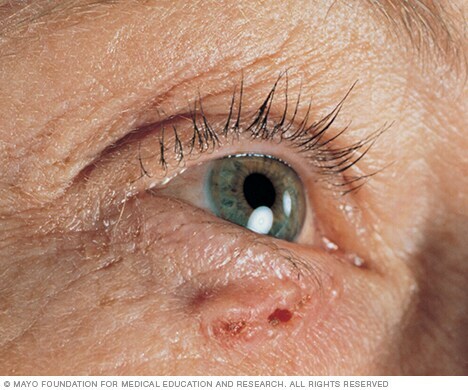 This photograph shows a basal cell carcinoma that affects the skin on the lower eyelid. 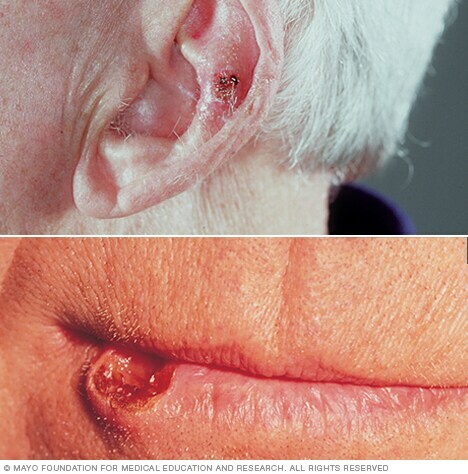 Sun-exposed areas such as the lips and ears are especially likely to develop squamous cell carcinoma of the skin. The first sign of melanoma is often a mole that changes size, shape or color. 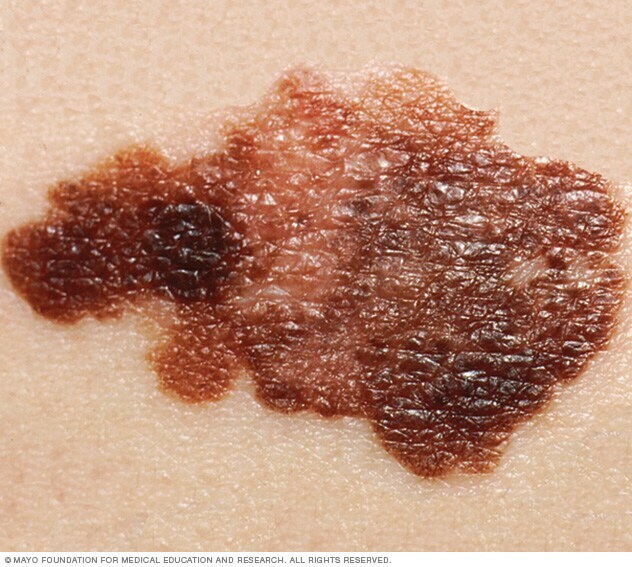 This melanoma shows color variations and an irregular border, both of which are melanoma warning signs. 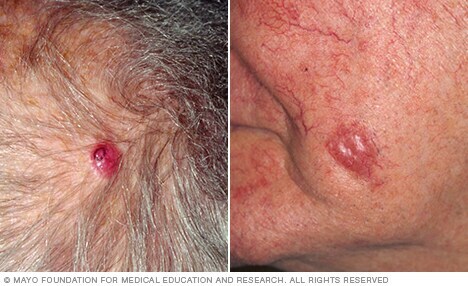 Merkel cell carcinoma is a rare, aggressive skin cancer. It appears as a painless, flesh-colored or bluish-red nodule growing on your skin. Skin cancer affects people of all skin tones, including those with darker complexions. When melanoma occurs in people with dark skin tones, it's more likely to occur in areas not normally exposed to the sun, such as the palms of the hands and soles of the feet. Skin cancer begins in the cells that make up the outer layer (epidermis) of your skin. 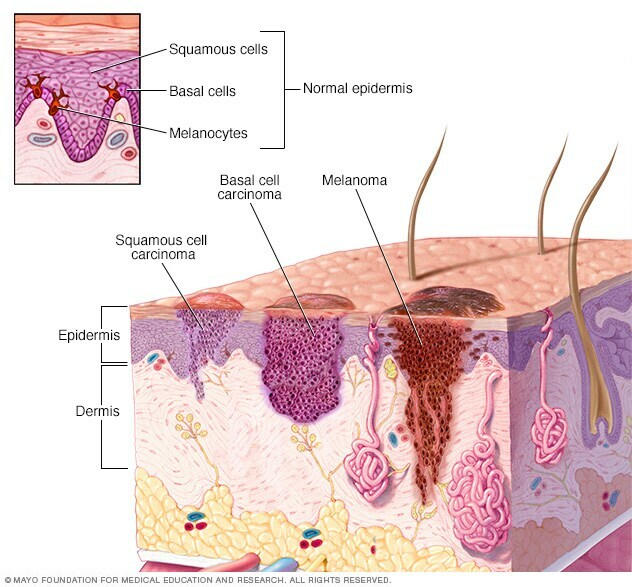 One type of skin cancer called basal cell carcinoma begins in the basal cells, which make skin cells that continuously push older cells toward the surface. As new cells move upward, they become flattened squamous cells, where a skin cancer called squamous cell carcinoma can occur. Melanoma, another type of skin cancer, arises in the pigment cells (melanocytes). Use a broad-spectrum sunscreen with an SPF of at least 30, even on cloudy days. Apply sunscreen generously, and reapply every two hours — or more often if you're swimming or perspiring. Use a generous amount of sunscreen on all exposed skin, including your lips, the tips of your ears, and the backs of your hands and neck. Habif TP. Premalignant and malignant nonmelanoma skin tumors. In: Clinical Dermatology: A Color Guide to Diagnosis and Therapy. 6th ed. St. Louis, Mo. : Saunders Elsevier; 2016. https://www.clinicalkey.com. Accessed June 26, 2018. Niederhuber JE, et al., eds. Melanoma. In: Abeloff's Clinical Oncology. 5th ed. Philadelphia, Pa.: Churchill Livingstone Elsevier; 2014. https://www.clinicalkey.com. Accessed June 26, 2018. Jameson JL, et al., eds. Cancer of the skin. In: Harrison's Principles of Internal Medicine. 20th ed. New York, N.Y.: The McGraw-Hill Companies; 2018. https://accessmedicine.mhmedical.com. Accessed Nov. 13, 2018. Sarcoma-Kaposi. American Society of Clinical Oncology. https://www.cancer.net/cancer-types/sarcoma-kaposi/view-all. Accessed Dec. 12, 2018. Sebaceous carcinoma: Signs and symptoms. American Academy of Dermatology. https://www.aad.org/public/diseases/skin-cancer/sebaceous-carcinoma#symptoms. Accessed Dec. 12, 2018. Warner KJ. Allscripts EPSi. Mayo Clinic, Rochester, Minn. July 19, 2018.